Hi, just wondering if the new Galactic Bundle DLC is locked to PC. Myself and another user on the steam forum, don't seem able to access the DLC content, and what we have in common is that we are Mac users. Is the DLC Windows only? If so, will there be a Mac exclusive? If not, then I guess the problem is that I cannot access the DLC. 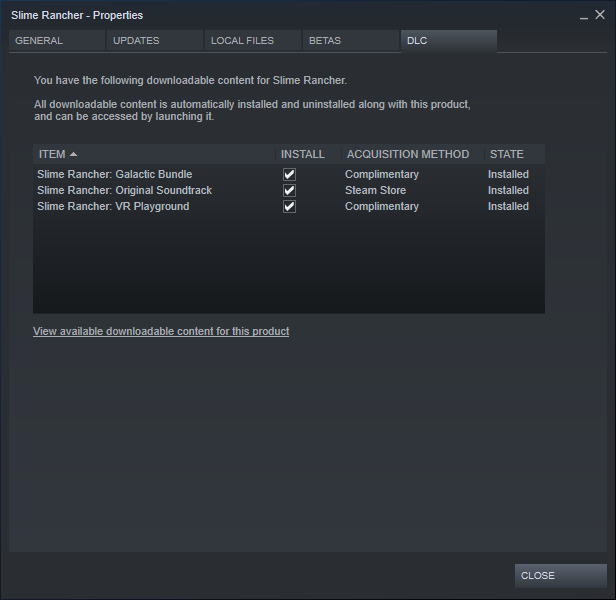 I updated Slime Rancher on Steam, and when I launch the game I see the Galactic Items listed under "manage DLC" but it just sends me to the steam page for more info. On the steam page, if I click "download" next to the DLC it just opens the game. My save is maxed out, the science lab is unlocked, I am max level in the 7Zee rewards club. Any advice to get this working? It's supposed to open up the game; if you click Manage DLC after downloading, it will say "Installed"
Lionmeow wrote: It's supposed to open up the game; if you click Manage DLC after downloading, it will say "Installed"
It does not, though. It just says "View in Store"
I have the exact same problem on Linux. A number of people over on Steam are now commenting over a couple of different threads that they have the same issue on Mac and Linux, I guess we can confirm this is probably a Mac/Linux issue. Sorry about the trouble, everyone. I just wanted to let you know that the DLC is not for PC only - or shouldn't be. We're currently looking into what might be causing the behavior you're seeing. If you go into your game Steam Library, right click Properties. Do you have a DLC tab? If so, it showcases the DLC you have installed. Apparently it isn't present on Mac and Linux versions but if it is, and the Galactic Bundle is listed, untick it and re-tick it which should force a download, or make the game realise the DLC is installed. It worked for me for VR Playground and the Galactic Bundle. Maria wrote: I just wanted to let you know that the DLC is not for PC only - or shouldn't be. Maria wrote: Sorry about the trouble, everyone. I just wanted to let you know that the DLC is not for PC only - or shouldn't be. We're currently looking into what might be causing the behavior you're seeing. I don't know what you did to change things, but I just opened Steam to try the Properties trick mentioned above, and before I tried it I started the game to check it was still not showing up (I changed nothing) and... the DLC is showing up as Installed now and is present in the game.